The BP oil spill was one of the most devastating man-made disasters to have occurred in recent history, so it is hardly surprising that it would be the measuring stick against which all other similar disasters would be compared. Now, in the wake of the recent oil spill, many are now making the inevitable comparisons with the BP disaster. Let's see what the two have in common. The official cause of the China oil spill was an explosion in the main pipeline, which occurred after workers continued to pump a sulfur-stripping agent after a cargo of oil had been unloaded by a tanker. The accident occurred on July 16, 2010, in a pipeline owned by one of the biggest oil producers in Asia, China National Petroleum Corp. The BP oil spill occurred only a few months earlier, on April 20 of the same year, and it was also caused by an explosion, this time on the Deepwater Horizon oil platform. 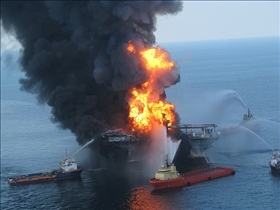 It was caused by the bursting of a well pipe and a series of malfunctions, which released oil 5,000 feet underwater. Five days after the China oil spill, the oil had managed to cover an area more than 430 square kilometers, and this has had the effect of reducing the volume of oil shipments originating from the region. While state run news organizations have announced that the oil spill has already been contained, many environmental groups suspect that the amount spilled is considerably more than amount officially stated. The BP oil spill is definitely a disaster of epic proportions, and more than 400 square miles had been covered ten days after the event. For a time, as much as 210,000 gallons of oil were poured into the ocean daily. The China oil spill is expected to cause considerable damage to the marine life and water in the area. The announcement was made by deputy bureau chief for the city's Maritime Safety Administration, Huang Yong, who also said that sea birds would be adversely affected by the accident. 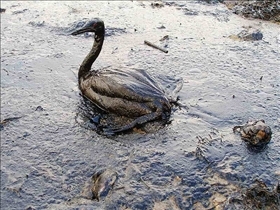 The BP oil spill has had a wide ranging devastating effect on the animal and plant life in the region, it is thought that the oil may reach the gulf stream and eventually make its way to Europe. The region has long suffered from the effects of chemical contaminants deposited via the Mississippi River and recovery predictions are bleak. Also, the oil dispersants used by BP could hamper recovery efforts tremendously, although the full extent of the damage will not be known until several years from now. These events along with others such as the Russian oil spill which resulted in the detonation of a nuclear bomb to seal the deep water Arctic leak, should send a clear message that the time for exploring, funding and encouraging everyone to use alternatives to oil is now. Official cause was an explosion in the main pipeline of China National Petroleum Corp. Which is the worst oil spill? BP Oil Spill vs. Exxon Valdez: Which is worse?